September 05, 2018 "Information Clearing House" - As we detailed earlier, in what appears to be the latest escalation in the UK government's campaign to blame Russia for the poisoning of former double agent Sergei Skripal, his daughter Yulia Skripal and three other seemingly random Britons (one of whom succumbed to the deadly Novichok nerve agent used in the attacks), British prosecutors are saying they have "sufficient evidence" to charge Alexander Petrov and Ruslan Boshirov, both Russian nationals, with conspiracy to murder Skripal, as well as the attempted murder of his daughter and police detective Nick Bailey, according to Reuters. There's just one thing... About that CCTV feed! Russia has apparently developed an astonishing new technology enabling its secret agents to occupy precisely the same space at precisely the same time. 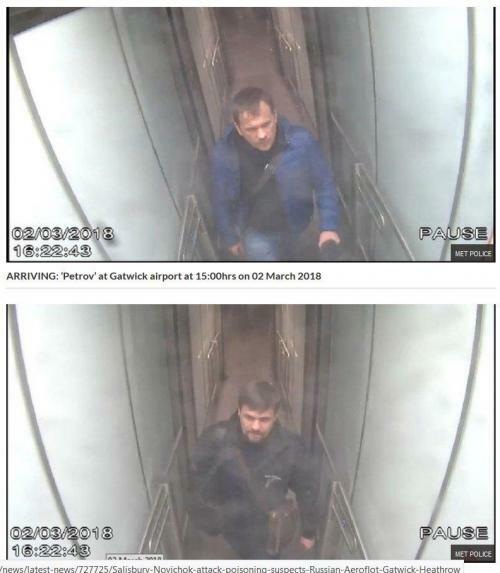 These CCTV images released by Scotland yard today allegedly show Alexander Petrov and Ruslan Borishov both occupying exactly the same space at Gatwick airport at precisely the same second. 16.22.43 on 2 March 2018. Note neither photo shows the other following less than a second behind. Will any mainstream media organizations question this publicly? Today, in a politically convenient moment, the British government released new information about the poisoning of the British spy Sergej Skripal, his daughter, and three other persons. 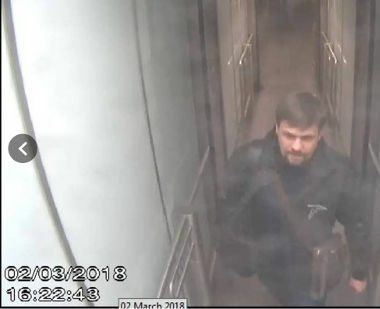 It claims to have identified two men with Russian passports who arrived in London from Moscow on March 2, went to Salisbury on March 3 on a 'reconnaissance' trip, came back to Salisbury on March 4 to put Novichok poison on the doorknob of Skripal's home and flew back from London to Moscow on the same day. The names of the men were given as Alexander Petrov and Ruslan Boshirov which are Russian language equivalents of Joe Smith and Sam Jones. These names are likely false. The police says that CCTV pictures were taken at several steps of the men's travel. The British news agency Reuters seem to distribute these. Several media have picked up copies. Notice that the time stamp on both pics is identical, 02/03/2018 16:22:43. But the pictures show two different men, each walking alone through the same part of a jet bridge as they arrive in Britain. How can it be that both of these pictures were taken at the exactly same second? And who tilted the permanently installed CCTV camera between the two shots? How did the camera angle change between pic 1 and two which were apparently taken at the very same place and at the very same time? The full statement of the Metropolitan police is here. Excerpts of Prime Minister Theresa May's statement are here. While May claims the two men were send by Russia's military spy service GRU, the Metropolitan police makes no such claims. Theresa May did not say on what evidence she based her conclusion. There seems to be none. It also seems a bit curious that a 'Russian assassin' team, allegedly from a highly professional secret service, would travel together and use direct flights from Moscow to London and back. That seems extraordinary careless. Why not fly separate and via a third country? And why would a professional assassin team drop a cellophane wrapped, unopened perfume bottle with the same poison into a charity bin behind shops in Catherine Street in Salisbury where Charlie Rowley would find it some 14 weeks(!?) later? 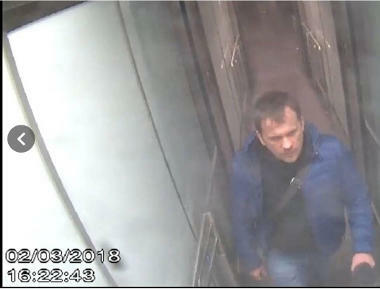 The police says that it found traces of Novichok in the crappy hotel the 'Russian agents' stayed in between March 2 and March 4. It found those traces on May 4 but it waited until today to publicly ask other guests at the hotel to contact the police? If the incident was a professional assassination attempt with a highly potent 'Novichok' compound why did 4 out of 5 people who came into contact with it survive? The 80% failure rate is inconsistent with the scary tale about the highly potent 'Russian' Novichok poison. 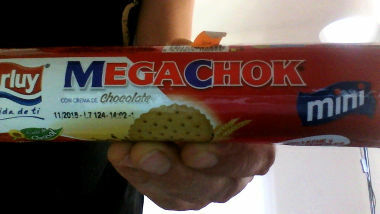 A decent dose of Megachok is probably more lethal. Sergej Skripal has not been seen in the public or even on video since the incident happened. His daughter Yulia Skripal appeared in a British government hostage video but then vanished. The Russian Embassy in London says that it has no access to them. The policeman, who allegedly was also injured during the incident, also never reappeared in public. Why are these people held incommunicado and under arrest?